Like one of those massive Moonie weddings, there were multiple commitments being made today as airlines around the world got hitched. All manner of couplings were going on but the one that caught the bouquet as far as I'm concerned is the one I attended in New York City. 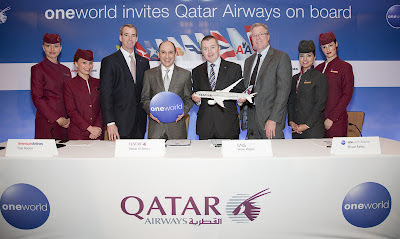 At the fancy pants Four Seasons Hotel, Qatar Airways pledged its troth to oneworld. 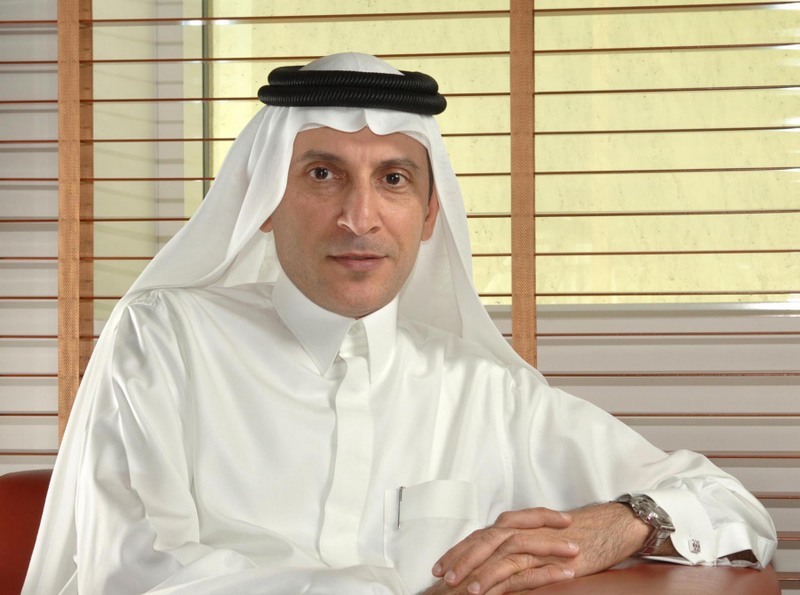 As the inimitable Qatar boss Akbar Al Baker beamed, his airline became the twelfth member (designate) and the first Gulf carrier to join an alliance, any alliance. Qatar opens 15 destinations and three countries; Rwanda, Iran and the Seychelles to the network. But as an observer of international aviation, what I find notable is how quickly the Arab troika of airlines Qatar, Etihad and Emirates have gone from the upstarts western legacy carriers loved to hate, to the airlines flying left seat. Because I couldn’t get a question in to save my life during the press conference, I grabbed Al Baker afterwards and asked him what it felt like to go from the business bad boy to coveted partner in two short years. “It is a satisfaction,” he told me. “Every step forward the airline takes, every recognition the airline gets, it is for us a great sense of achievement.” But I couldn’t help but wonder if Al Baker doesn’t still harbor some lingering resentment toward the chief executives who will be his wingmen. It wasn’t that long ago the mere mention of Qatar, Emirates or Etihad would get the steam going out of the ears of Qantas boss Alan Joyce. Now Joyce is partner with Akbar and running code shares with Emirates out of Dubai no less. All’s fair in love and aviation, perhaps? Well Akbar seems to thinks so. The ceremony. Photo courtesy oneworld. 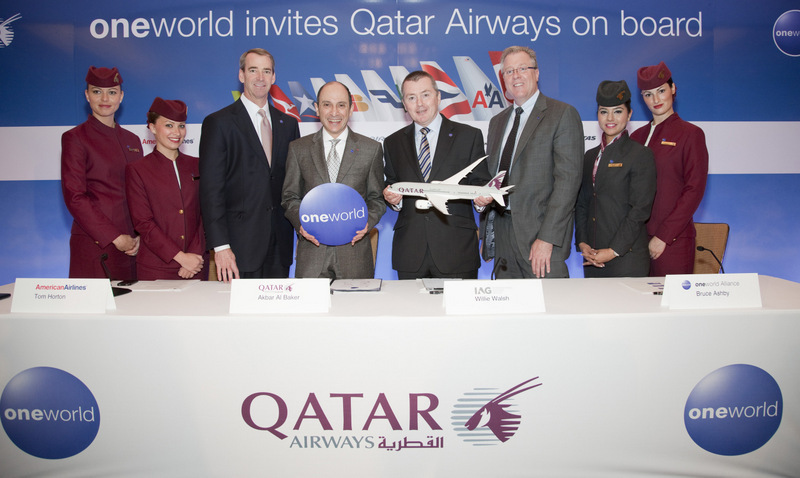 Make of it what you will, oneworld was the only airline alliance to actually invite Qatar to join. The other two, SkyTeam and Star Alliance hinted around, Al Baker told me, but nothing more. Even as Al Baker, American's Tom Horton, IAG's Willie Walsh and oneworld chief Bruce Ashby preened with the Qatar flight attendants, exchanging model airplanes for oneworld logos, another gulf carrier was making a different kind of deal with KLM/Air France. Rather than join somebody else's club Etihad's boss Jim Hogan is furiously working to create his own. The airline announced new code share agreements with KLM and Air France that will add routes from Amsterdam and Paris to Abu Dhabi and beyond. In a statement the airline said this was the first step in a tango that could become a "much larger strategic partnership." Etihad already holds an ownership interest in Aer Lingus, Virgin Australia and airberlin, which also happens to be a member of oneworld. So, you can see that these are some multifaceted nuptials Hogan is whipping up. If it feels like everybody is on the dance floor, that’s because they are. But when it comes to calling this kind of deal making for what it really is, you have to give it to the executive in charge of oneworld's newest airline for making these pragmatic deals sound, well, almost romantic. 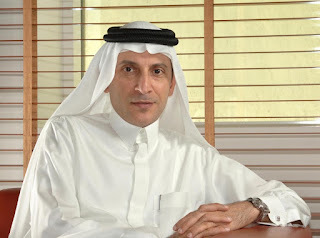 "Until a few months ago Air France was so critical of the Gulf carriers," Al Baker said. But Etihad is "one of the companies they now want to go to bed with." Marriage of convenience? The expression seems tailor made for days like this. Star Alliance appears to be left out or not interested. They were the most critical of the Gulf carriers especially Air Canada supported by Lufthansa. Did they miss an opportunity? Time will only tell.